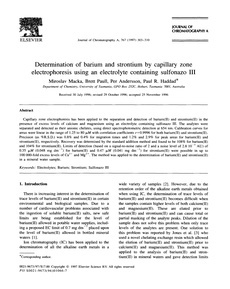 Capillary zone electrophoresis has been applied to the separation and detection of barium(II) and strontium(II) in the presence of excess levels of calcium and magnesium using an electrolyte containing sulfonazo III. The analytes were separated and detected as their anionic chelates, using direct spectrophotometric detection at 654 nm. Calibration curves for areas were linear in the range of 1.25 to 80 μM with correlation coefficients r = 0.9996 for both barium(II) and strontium(II). Precision (as %R.S.D.) was 0.8% and 0.4% for migration times and 1.2% and 2.9% for peak areas for barium(II) and strontium(II), respectively. Recovery was determined by the standard addition method and found to be 108% for barium(II) and 104% for strontium(II). Limits of detection (based on a signal-to-noise ratio of 2 and a noise level of 2.8 10−5 AU) of 0.35 μM (0.048 mg dm−3) for barium(II) and 0.47 μM (0.041 mg dm−3) for strontium(II) were possible in up to 100 000-fold excess levels of Ca2+ and Mg2+. The method was applied to the determination of barium(II) and strontium(II) in a mineral water sample.